Barbara Gordon is back! No longer lame, but a Lame Comeback! OK, full disclosure. 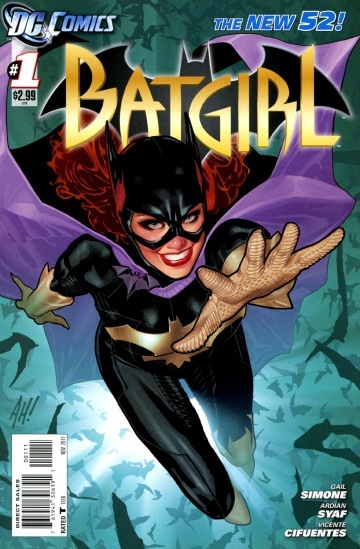 I loved the original Batgirl, Barbara Gordon. I was excited to hear she was coming back after over a decade being the victim of the Joker. However, I must say, this new start in the “new 52” disappointed me. For those who may not remember, Batgirl was savagely attacked by the Joker in the now classic story “The Killing Joke,” leaving her paralyzed and emotionally scarred. Barbara, showing her character as a never give up honest to goodness hero, became Oracle, the information gatherer and hacker for the DC Universe’s heroes. She became the information gatherer for the Justice League, as well as the brains behind the Birds of Prey. She also helped train some of her successors in the Batgirl cowl. She became an inspiring and endearing character as Oracle, an inspiration to handicapped fans everywhere. Her comeback had to be more than a plea to nostalgia. However, that is what I get from this book. It begins well, with a willing but afraid Barbara beginning her career as Batgirl once again. She shows rust and some fear in dealing with the criminals in Gotham. However, the backstory to her return to walking upright is rather short and contrived, with the violent and garish injury suffered at the hands of the Joker being in the backburner. It makes it appear that she just rehabbed for a few months and came back. This marginalizes her role as Oracle to a great degree. Again, I think this was done as aprt of the larger stunt of gaining attention. While there are some interesting and poignant moments, like Barbara telling Jim Gordon she is moving out, and meeting her roommate, for the most part this book rings hollow. While the internal doubts make sense given her injuries, the glossing over of all the work it took to come back physically just shoots the whole thing apart (pardon the phrasing). We needed a real comeback story, not a “let’s just say she rehabbed and got better” angle. Show us more of the rehab. Show us the doubts. Barbara was always the more human Batman. Yes, cunning and smart, but frequently doubtful and frequently showing her amazing fragility and humanity. We get glimpses, but not enough. To be truly inspiring again, we need to see her struggles. We don’t see that enough. The story involving the Mirror, is a true mystery in the Bat family style. Hopefully it will provide more entertainment and exploration than this first poor attempt to get Barbara Gordon back in the Batsuit.